Two female gliders from Shenyang Aerospace University, northeast China's Liaoning Province, had a successful maiden flight on November 10. Hou Xiaojuan, one of the women in the paragliding team, joined the team in the second semester of her freshman year. She was interested in flying even though she was not in a flight-related major. She was the first female paraglider in her university and joined in training once a week together with the male gliders. Hou trained for one year on the ground, but she felt frightened every time she saw the male gliders flying in the sky. The biggest obstacle for paragliding is terror rather than physical challenge; only those who have experienced paragliding truly understand this. Taking a run-up from a mountain slope or cliff is necessary before taking off. Many women are afraid of jumping and will stop at the edge of the cliff. In order to overcome this psychological obstacle, they usually do training to simulate the feeling of flying and learn to control their fear. "If you stop because of fear for just once, you may not be able to fly in the future due to this psychological shadow," she explained. Ma Yixin, the other female glider, joined the paragliding team in September and trained for only two months before she made her maiden flight. "Many people say that as it's an extreme sport, paragliding is not for girls, but they wouldn't say this if they had experienced the fun themselves. When I was flying in the air, the broad vision and smooth flight experience dispelled all my concerns. The wonderful experience of flying really surpassed my imagination," said Ma. 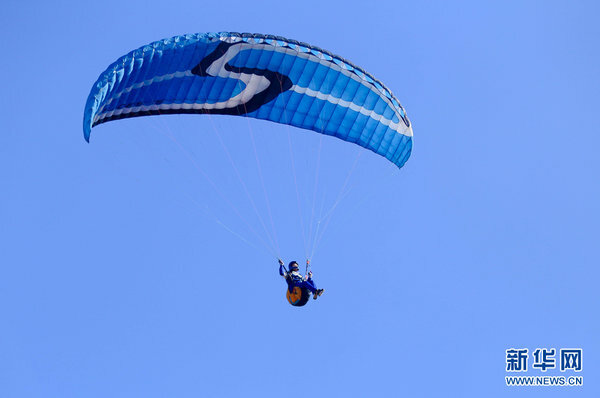 The leader of the paragliding team, Qin Shaorui, said that there have been about 10 female paragliders since Hou joined. Women's control of the parachute isn't as good as men when they first start since their physical conditions are different. Their psychological control ability can also be weaker than men, so women have to put more effort into training. "It was great for Hou and Ma to have an excellent landing and take-off in their first flight. This also proved that they trained very hard," said Qin.